Homemade elderberry syrup is so easy to make, plus it’s 30-50% cheaper than store bought, and works better too! Elderberry syrup, cough drops, and gummies have become a popular natural method of fighting off cold and flu in recent years, and with good reason – they work! 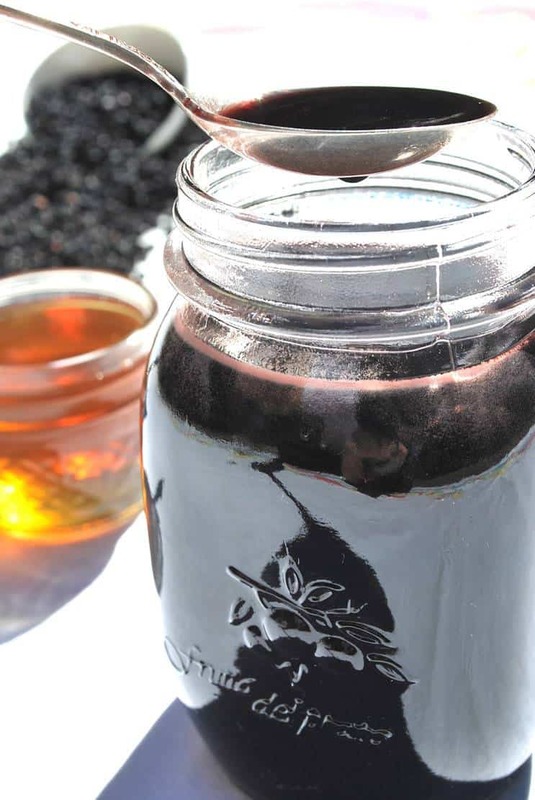 Making your own elderberry syrup only takes 15 minutes and is 30-50% cheaper than store bought versions…and, in my experience, works better too! Elderberries are one of the most concentrated sources of anthocyanins, anti-inflammatory and antioxidant compounds found in lower amounts in blueberries and blackberries. Anthocyanins have been shown in studies to have protective effects against dementia, atherosclerosis, and some cancers (1-3). Elderberries should not be consumed raw since they can cause nausea and vomiting, and elderberries (cooked and raw) should be avoided by pregnant and breastfeeding women until more is known about safety in these conditions. Honey should not be given to children under 12 months of age. This really couldn’t be any easier. Once you’ve ordered dried organic elderberries, you just simmer, strain, and add honey. The syrup can be stored in the fridge for a week or so, or can be frozen in a large mason jar – just be sure to leave room at the top for expansion. To defrost, just place in the fridge for 24 hrs. We mostly take elderberry syrup four times each day, beginning with the first day we have symptoms, and continuing a few days after symptoms subside. My husband and I take 2 oz per “dose” and the kids take 1 oz. Sometimes I stir in some vitamin C powder for an extra immune boost! Once when my daughter caught a summer cold, we combined the syrup with grape juice to make these elderberry juice pops, which were a HUGE hit! 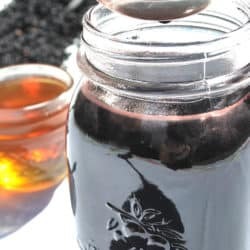 Homemade elderberry syrup is so easy to make, plus it's so much cheaper and works better to fight off cold and flu than store bought versions! Place berries and water in a medium sized pot on the stove. Bring to a boil over medium-high heat, then turn down to la very low simmer for about 5 minutes. Use a strainer to pour the liquid into a bowl or glass jar (I use a large mason jar or an empty 32 oz juice jar with a large funnel placed over the opening). Add the honey and whisk (if in a bowl) or place the lid on the jar and gently turn/shake until honey is mixed in (I wrap a kitchen towel around the jar to protect from the heat). Store in fridge. To serve, pour 1 oz per child or 2 oz per adult into a glass 4-5 times/day. Can dilute each "dose" with water if preferred. This mixture freezes well - just be sure there's plenty of room at the top of the jar for expansion. To defrost, place in the fridge for 24 hours. If giving to children less than 12 months old, omit the honey. Len, et al, 2016. Effects of anthocyanins on the prevention and treatment of cancer. British Journal of Pharmacology, 174(11): 1226-1243. Accessed: https://doi.org/10.1111/bph.13627. Krawitz, et al., 2011. Inhibitory activity of a standardized elderberry liquid extract against clinically-relevant human respiratory bacterial pathogens and influenza A and B viruses. BMC Complementary and Alternative Medicine, 11(16). Accessed: https://doi.org/10.1186/1472-6882-11-16. Zakay-Rones, et al. 2004. Randomized study of the efficacy and safety of oral elderberry extract in the treatment of influenza A and B virus infections. J Int Med Res, 32(2):132-40. Accessed: http://journals.sagepub.com/doi/pdf/10.1177/147323000403200205. thank you for sharing. I think that we don’t utilize the beautiful herbs, fruits and veggies that nature has to offer to prevent sickness. I appreciate you sharing this post and driving awareness. Pinned. So true, Dagmara! Thanks for reading and for your kind words! I was going to ask, what do you use this in – but I see that you can just drink it straight! I get the flu way too often. I’ll keep this in mind, thanks! This is a great recipe! Definitely making this soon! This post comes at the perfect time for me and my family. The kids are beginning to.come down with a cold and I need to nip it before it hits me. Haha! Will be saving this! Yes! I’ve found the key with natural remedies is to start early, be consistent, and continue until a few days after symptoms subside! I don’t think there’s elderberry here in the Philippines? Or if there is, I don’t think there’s a lot in the market. So sad because I want to give it a try specially it’s cold and flu season. 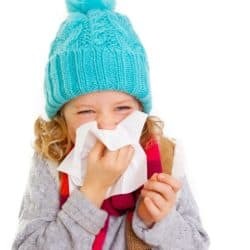 I’m sorry to hear that, Yanna – this post has a list of other things we do to boost our immune function and fight colds and flu naturally. Hopefully, you’ll find some tips there you can use! I want to try this. I appreciate you sharing this post and spreading awareness. This is such a great information. When I was little my grandparents used to make home made cough syrup, but I can’t remember what was the base of it. It’s always good to go natural over store bought full of chemicals medicine. This is so great! 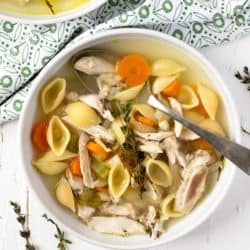 I need to make this ASAP because my kids are currently sick. Hope it helps them and they’re well again soon, Janise! It’s so good to make use of these fabulous ingredients! We just got some to try, my oldest has a really low immune system so I’m up for trying anything to keep her healthy! 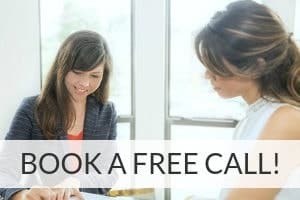 You may also want to look into high quality colostrum supplements since they contain immunoglobulins and can really help to boost immune function in those for whom it’s suppressed. I included it in my post about how to fight cold and flu naturally if you want brand and dosing information. This syrup looks wonderful. I’ve only had elderberries once – they’re hard to get fresh as they don’t keep for long, but now I know to look for dried. I have never heard of elderberry, but it seems like it has some great benefits. Thank you for sharing the recipe. I will definitely be trying this! Wow, this is such great information. Now that I have a little one, I am thinking harder about using natural remedies instead of drugs. What a great thing to try! 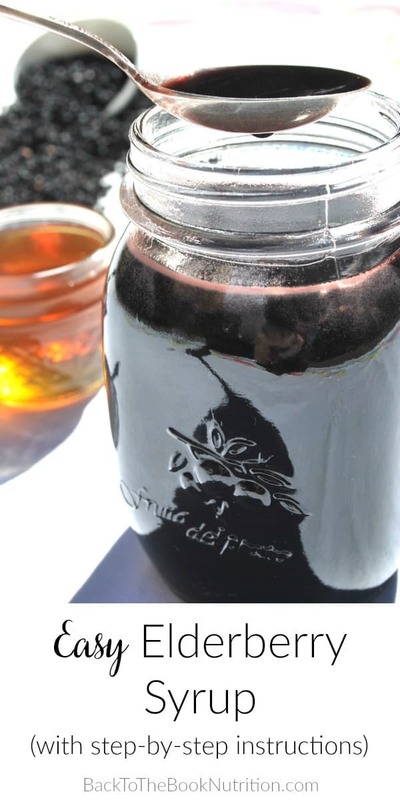 Elderberry syrup is something that I really need due to its wonderful ingredients. I would love to try this. This sounds amazing and it looks like something that I can use regularly. You had me at healthy and delicious. Any syrup with beery in them has to be good. I remember having to perfect the art for the berry sauce for the cheesecake I used to make and took me like a year to get the perfect sauce. I’m a huge believer in elderberry syrup! We take it before we fly and haven’t gotten sick yet! If nothing else, it makes me feel like we’re doing something to knock out sickness! This is great, I didn’t know about elderberry syrup! Very cool. 🙂 Thanks for sharing, I’ll need to try this myself! This sounds quite nice and even better that it helps with the flu. I will keep this in mind. Hi! Can you buy Elderberries anywhere besides Amazon? And if so, where is the most cost efficient place to do so? Can you grow these berries? Thank you! Excited to try this recipe out! I haven’t been able to find a local source for dried elderberries (I’m in Houston), but I have heard of people growing them. I live in Lancaster County, Pa and am able to find dried elderberries at a local Amish health food store. They are way too expensive on Amazon! But I realize not everyone can find them as easily. Maybe you could ask your local grocery or health food store to carry them! Thanks for this! After making the syrup, do you just discard the berries or can they be used in something else? I usually discard them but there’s not reason you couldn’t use them again. I’m assuming the flavor wouldn’t be as strong but, as long as you’re okay with that, it’s probably fine. I just waned to check this recipe out. I’ve been making elderberry syrup a few years now. But my recipe is slightly different with less elderberries, more honey and some ginger, cloves, and cinnamon. My concern with this recipe is that you only simmer for 5 minutes. 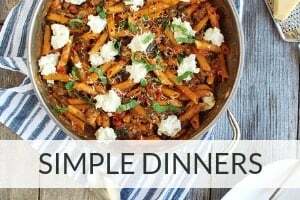 My recipe simmers for at least 45 minutes! I also take when pregnant and breastfeeding with no ill effects. Just check with a dr first. 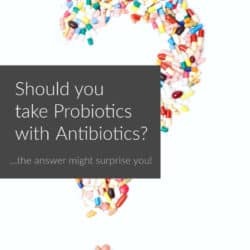 Is this good to take once a day to prevent the crud or is it better to take only when you feel you are coming down with something? I recommend only when you’re coming down with something since that’s what the scientific literature supports. Just be sure you start at the first sign of illness and continue a few days after symptoms subside. Hope that helps!